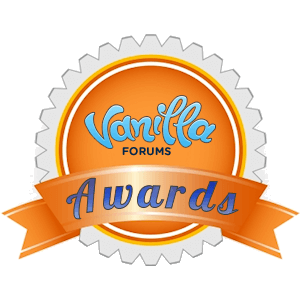 Due to an issue beyond my control, I could not meet the deadline for Preview Release for Vanilla Awards (Badges). The release is now scheduled after Easter, on 06/04/2013. I will use the additional time to fix some issues I found and to add some more features to the plugin. One of them, the Awards Leaderboard is complete (screenshot below). I would like to thank all the readers who registered for the Preview Release and apologies for the delay. I wish all of you a great Easter! As we are getting closer to the pre-release, I finally have some time to adjust the look and feel of the (many) User Interfaces of the plugin. I took a couple more screenshots and added them to the gallery in the original announcement. Feel free to have a look, any feedback is welcome! It took a lot of time and effort, but the first version of the Badges/Awards Plugin for Vanilla Forums 2.0 is coming out soon! This plugin was developed following the requests and feedback of several Users, and it has be named Awards to avoid confusion with the free Badges plugin released recently. Based on current schedule, the Preview Release should be available by 29/03/2013. Fully customisable set of Rules. Support for virtually unlimited Badges, each with its own image. Support for virtually unlimited Badge Categories, each with its own image and CSS style (for advanced Users). Ranking Points (to be used with Ranking Plugin, in development). Tracking and notification of awarded Badges. Badges Widget, to show everybody your achievements. Here are two screenshots of the plugin in its current status. Just a bit more polishing, and it will be ready to go! Award details, together with a list of its most recent recipients. This page shows all available Awards, together with an indication of which ones current User already earned. Initially, a Preview Release of the plugin will provided at a discounted price to a few selected Users who agreed to become early adopters, and who are aware that, due to the plugin complexity, there may be some minor issues still to be solved. If you would like to be considered for the pilot, please register your interest using the Contact page. Thanks for your patience, and see you soon on release day! https://aelia.co/wp-content/uploads/2014/07/AeliaLogo_201310.png 0 0 diego https://aelia.co/wp-content/uploads/2014/07/AeliaLogo_201310.png diego2013-03-22 12:55:532013-05-26 23:53:58Badges Plugin for Vanilla Forums is coming! I’m happy to announce that now Post Scheduler plugin also delay the delivery notifications of New Discussions to the scheduled date and time. It wasn’t easy to implement such feature on both Vanilla 2.0 and 2.1b, as none of them are designed to allow stopping a notification before it’s sent, but it’s now done. To get the latest version, simply use the links you received when you purchased the plugin. Please note that the new version requires the Cron Jobs Plugin, available free of charge, and the configuration of a Cron Job to deliver the scheduled notifications. Before you install the new version, please make sure you read the instructions contained in the readme.html file included in the zip file. Due to recent developments, price of Post Scheduler and other plugins is due to increase from the 11th of March, 2013. If you are interested in any of them, make sure you get them before the price go up! I would like to thank Mrs Taylor of KHT Montessori for providing the feedback that led to the development of this new feature. https://aelia.co/wp-content/uploads/2014/07/AeliaLogo_201310.png 0 0 diego https://aelia.co/wp-content/uploads/2014/07/AeliaLogo_201310.png diego2013-03-01 19:53:352013-03-01 19:53:35New update for Post Scheduler plugin!